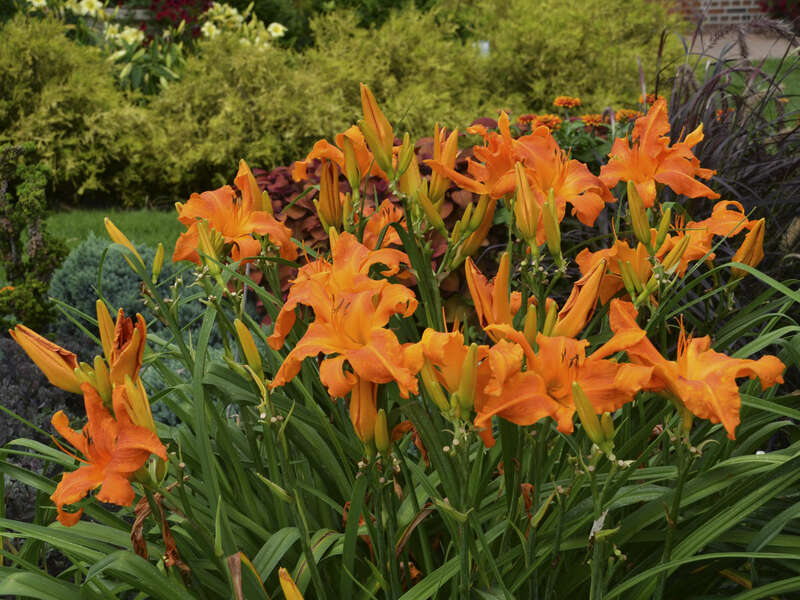 One of the reasons daylilies are so popular is because they are some of the easiest perennials to grow and can survive much neglect, drought, and other adverse conditions. However, if you want your daylilies to look their best, they will benefit from the periodic care described below. Water is the most essential factor in growing healthy, beautiful daylilies. Daylilies love water during the growing season and prefer about an inch of water per week. In many areas, regular rainfall will supply much of that amount. 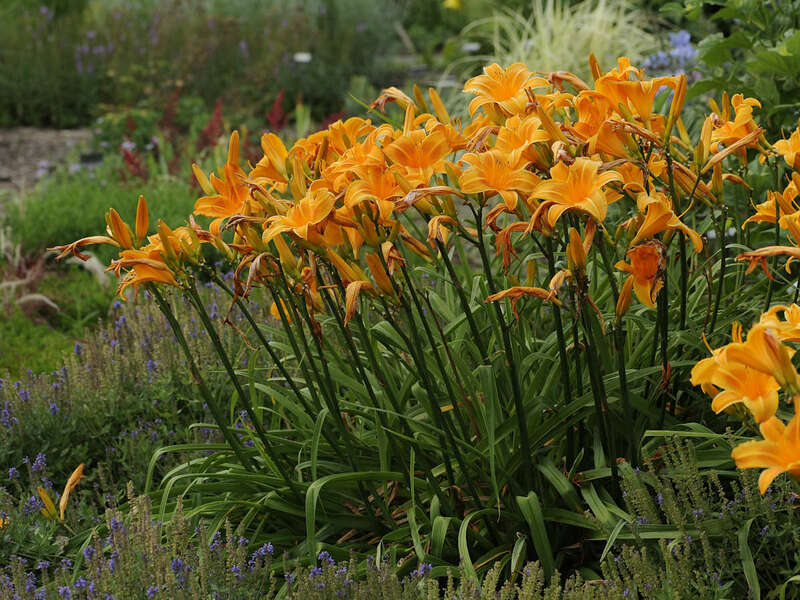 In areas where rainfall is less consistent, supplemental watering will benefit your daylilies enormously. Supplemental water can be applied overhead through sprinklers or by hand or through drip irrigation systems. Daylilies grow well in any reasonably fertile garden soil. However, a little extra fertilizer can work wonders. If you fertilize only once a year, do so in early spring as new daylily top growth emerges. Spread a handful of any general purpose fertilizer such as 5-10-10 or 10-10-10 around the base of each daylily clump. In areas that receive regular rainfall, the fertilizer does not have to be watered in. In other areas, watering the fertilizer in is beneficial. If you are able, it is a good idea to fertilize your daylilies a second time during the year, a few weeks after they are finished blooming. This will help your plants multiply faster and deliver a stronger bloom performance the following year. 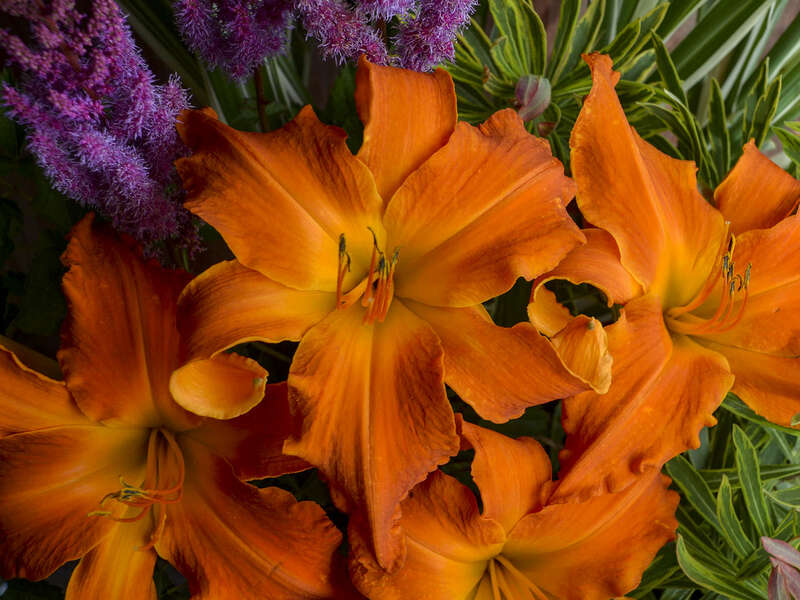 Deadheading daylilies is really a matter of personal preference and is not essential to growing healthy plants. Most public gardens, major landscape plantings, and highway roadside plantings of daylilies are never deadheaded. However, daylilies look their best when spent blossoms are removed. The removal of wilted blossoms also inhibits seed set. If maintaining a neat garden is not a priority for you, the spent blossoms will usually fall from the scape in a few days. Leaving lots of spent blossoms on large-flowered daylily plants may leave them looking a bit untidy, so many gardeners simply snap off the spent blossoms as they stroll through the garden admiring their plants. Once all of the flowers have blossomed on a scape, you can cut the entire scape back to the ground. If you do not cut it back, it will simply turn brown and remain standing until you cut the entire plant back in the fall. Some daylily cultivars, especially older types, are extremely fertile and set seed pods readily as the natural result of wind or insect pollination. If these seed pods are allowed to mature and spill their seed in and around the clump, some "volunteer" seedlings may grow up around the original plant. If you allow these seedlings to grow and bloom, you will notice that their flowers do not look like the original parent plant. If you hadn't realized that these plants were seedlings of your original plant, you may wonder if your daylily is changing its characteristics. It is not. Daylilies are genetically stable and are not prone to sporting like some other perennials are. If you do not want to keep these volunteer seedlings, simply dig them out and discard them. If you do not want to deal with volunteer seedlings again, be sure to remove the seed pods before they drop their seeds next time. Once you have had several hard frosts in your area, the foliage of your daylilies will turn brown and dry up. Some gardeners choose to remove this dead foliage in the fall while other gardeners prefer to leave it in place as a form of winter mulch and then remove it in the spring. Years of observation by experienced daylily growers have revealed no difference in plant performance the following year regardless of when the dead foliage is removed. Whatever works best for you is just fine. Just be sure that all the dead foliage is gone by the time the new growth resumes in the spring. After remaining in place undivided for four years or more, most modern daylily cultivars will show some gradual decline in bloom quantity and quality. This is their way of telling you that they are ready to be divided. When daylily performance begins to go downhill, it is time to dig and divide the overgrown clump. Daylily division is a relatively simple task but requires a bit of muscle if the clumps are large. Though it can be done any time the soil is workable, it is best done right after the daylily has finished blooming. Daylily division can be done a number of ways. If the clump is not too large, you could simply cut the clump right down the middle with a shovel and dig out one of the halves, leaving the other half in place. If the clump is fairly large, it would be better to dig out the entire thing and divide it down from there. If you choose to dig out the entire clump, grab a shovel or gardening fork and a tarp. Lift the entire clump from the ground and shake off as much soil from the clump as possible (this is much easier to do if the soil is dry at the time). If you are planning to divide the clump way down into single fans, you may want to wash all the soil from the roots using a garden hose with a sharp stream nozzle to make the job easier. If you are just going to separate the clump into a few pieces, washing the soil off is not necessary or recommended. With the clump sitting on your tarp, use your shovel or a sharp knife to divide the clump down into smaller pieces. Don't worry about slicing through the crown. Daylilies have enormous regenerative and recuperative capabilities, and healthy new plants will develop even from damaged crowns. It is best to leave three or four fans in each division so that your new plants will still be showy bloomers the following year. If you need a lot of divisions to fill a large area, it will not hurt the plant to divide it down into one fan divisions. However, these small divisions will require a bit longer growing time to redevelop into showy clumps. Discard the old, woody center of the daylily clump; it is no longer productive and you have plenty of healthy new divisions to work with now. If you have extra plants, offer them to friends. It is best to plant your new daylily divisions as soon as possible after they have been made. You will likely have many more than can fit in the original location. Hopefully you planned ahead and have thought about where you are going to plant them! Plant them at the same level they were growing at originally, with the crown approximately one inch below the soil line. What to do, season by season, to appropriately care for and help your daylilies thrive! 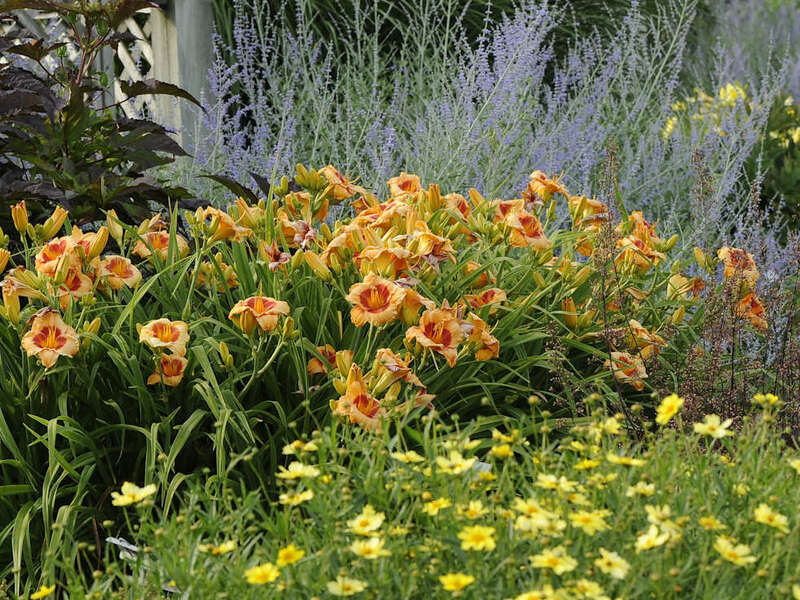 Modern daylily hybrids offer notable improvements. With over 40,000 registered cultivars in existence what criteria can the home gardener use in selecting better daylily cultivars for their garden? Daylilies are generally regarded as one of the most versatile perennials for use in landscapes. No other perennial comes in such a wide array of flower colors, shapes, heights, sizes, and bloom seasons. Daylilies are among the easiest to grow of all perennials. A few basic principles are useful to know to insure success in your efforts.